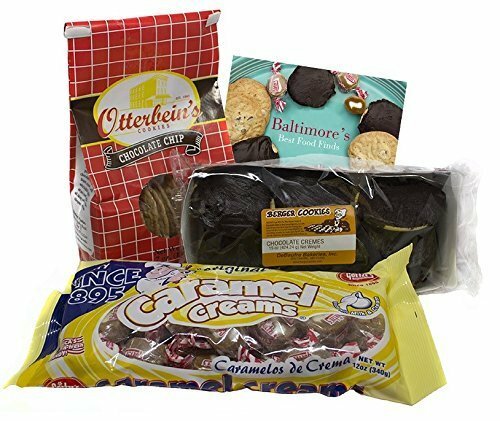 Berger Cookies, Goetze's Caramel Creams Candy, Otterbein's Cookies and Baltimore's Best Food Finds List. A 4 Item Gift Bundle by Baltimore Food Gifts at Smokey Robinson Foods. Hurry! Limited time offer. Offer valid only while supplies last. A sweet taste of Baltimore! A 15 oz. pack of Bergers soft and chewy Fudge Cookies, a 12 oz. bag of Goetze's Bullseye Caramel Creams Candy, a 7 oz. A sweet taste of Baltimore! A 15 oz. pack of Bergers soft and chewy Fudge Cookies, a 12 oz. bag of Goetze's Bullseye Caramel Creams Candy, a 7 oz. bag of Otterbein's thin and crispy Chocolate Chip Cookies plus a printed Bucket List of 16 Charm City Foods that can be purchased on Amazon or directly from the manufacturers. A tasty gift for anyone who misses Baltimore. Send one to friends and family!! Plus our exclusive bonus: a printed bucket list of 16 family owned Baltimore food companies and their websites included. Order them on Amazon or the websites. If you have any questions about this product by Baltimore Food Gifts, contact us by completing and submitting the form below. If you are looking for a specif part number, please include it with your message.